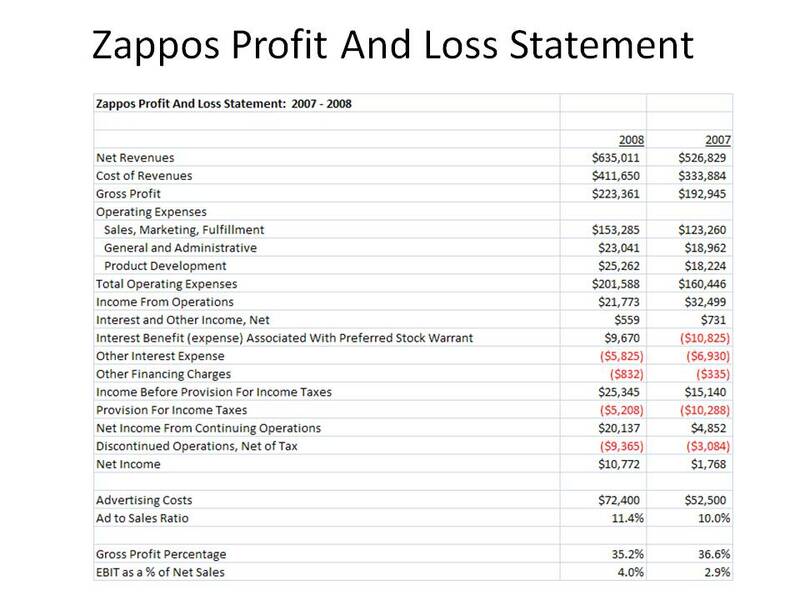 Thanks to a tweet from @manross on Twitter, I found the Zappos 2007-2008 profit and loss statement buried deep within documentation from Amazon.com. Net Sales of $635 million in 2008. If quoted gross sales of a billion are accurate, then the return rate is more than thirty percent, pretty typical for footwear, but crippling to a profit and loss statement. Gross Profit percentage is about 35%. Advertising Expense was $72 million in 2008, about 11.4% of net sales. For my catalog audience, pay close attention to this number --- it is far greater than your typical online marketing / advertising percentage, but is far less than the percentage of sales you're spending on catalog marketing. Long-term, the catalog industry will have to become significantly more efficient. Profit Flow-Through, after backing out advertising and G&A expense is 19%. You can run a profitable business with a 10% or 15% flow-through, but you need tremendous volume and a high level of operational efficiency. Conversely, most businesses I work with (many selling the same product that Zappos sells) generate 25% to 40% flow-through rates. Because Zappos has a comparatively low gross margin rate, they must generate significant sales volume without the aid of any advertising in order to cover this very low flow-through rate. To me, this one metric is the most disappointing thing I've seen in the Zappos business model. Pre-Tax Profit is 4%, and was 3% the year prior, far lower than what would be posted by a healthy shoe and/or apparel business. Granted, Zappos is early in the life of their business. The low flow-through rate destines Zappos to have mediocre pre-tax profit rates. All that being said, Zappos is still clearly a success. Because of Amazon's purchase, we finally get to see the warts, and all of our businesses have warts, don't they? Time for your thoughts. How does the Zappos p&l stack up against your business? As someone who has run a catalogue business in the UK, I was interested to read your breakdown on the Zappos P&L. The gross margin of 35% is worrying low. I have clients who also sell branded goods who achieve much better than this. I think there are two issues for the business, firstly their repurchase rate (as to whether they are in Retention, Acquisition or Hybrid Mode). If they are in retention mode (and IMO, I doubt it), they may be able to ride on the back of their upfront investment customer acquistion. The second issue is whether their acquisition by Amazon can result in either back office savings and/or cross-promotion. In terms of increasing their gross margin, their own brand effort looks pretty lame. There's room for improvement there. I don't know where I found the data, but I found somewhere that their retention rate was in the low 60s ... putting them in Retention Mode if my memory serves me correct. I could be wrong. As a retail shoe store owner, the most distressing part of Zappos' business, besides the low gross margins, is their inventory level. Shoes are not like wine, they don't get better with age, and shoes that come back up to a year later, with Zappos footing the bill, (pardon the pun)will have a deleterious effect on their business. Too-high inventory levels are a kiss of death, and too-high inventory of high fashion shoes, that don't retail in the first place, will eventually cause major pain. But, as long as they keep selling shoes at an incredible rate, the pain will come later--but it will come. But Zappos does get an A for PR. As chanel replica Gwen Stefani,Hilary Duff,Linda Evangelista & plenty of more,they are celebrities wearing Fendi bags.Right now there arelots connected with sites that are keeping clutches stuffs yet is a most effective which will basically makes it feasible to inside developing very much reductions on every single artist louis vuitton replica tote.Replica.com is the top level handbag supplier.Replica.com is very famous website regarding Replica handbags stuffs andbrands.The material used in all the stuffs whether the discount designer handbags are ofleather or cotton or ordinary fabric you will found the best materialused in them.These bags are stitched very hermes replica nicely & you will notfound any issue with them.For the reason that connected with middle budgets intended for dark brown buckskin clutches are usually continually applying & keep "very" crucial stuff like tote budget & also passport.Dark brown buckskin clutches are usually like charcoal buckskin clutches,there're common.Artist replica louis vuitton clutches include the simple must have of each trend woman.